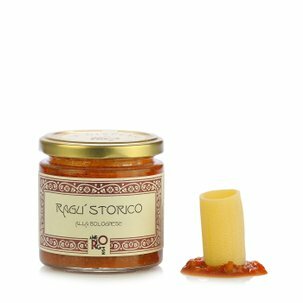 This ragù is prepared with full respect for the traditional Bolognese recipe, which pays attention to a careful balance between beef and pork. By trying this exceptional sauce, you will experience how to dine according to the true rules of the Emilian cuisine. Ingredients tomato passata, beef 24%, pork 16.3%, raw ham 7.7% (pork, salt), double tomato concentrate, extra virgin olive oil, carrots, Medicina golden onion, celery, Cervia sea salt. For more information on product labels, please contact our Customer Service department. The information on the labels of the products may vary for reasons beyond our control, therefore, there may be discrepancies between the information on the site and that on the products delivered. Please always check the information on the product before consumption or use.